React Native is a pretty amazing piece of technology from Facebook. It combines the best of web development and native development into one compelling package that holds the promise to have your mobile cake and eat it too! The React Native (RN) tagline is “Learn once, write anywhere: Build mobile apps with React.” And that is a very truthful statement, and it sets the expectations for what it is, and what it isn’t. For this tutorial, I am going to assume that you have some basic idea of what React Native is (from Facebook’s website) and take it from there. You have a tremendous amount of flexibility in using one codebase, or diving up your codebase to have very little overlap between your iOS and Android code. You can also leverage native components that you or others write in either iOS and Android. And you can use npm to load libraries into your codebase. Sounds too good to be true? It’s not - the price you have to pay for all this magic is having to learn a new way of doing things, especially if you have invested a lot of time and energy into iOS and / or Android development. 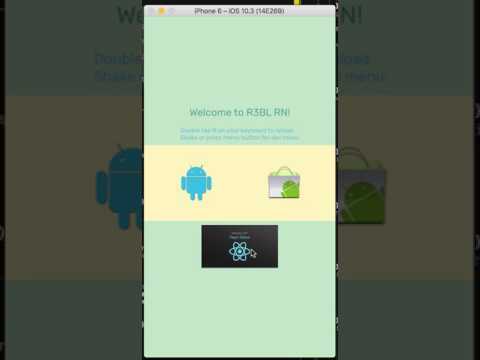 This tutorial will walk you thru the creation of a demo app that works on both Android and iOS. Starting with app layout and styling using Flexbox. Getting into deeper aspects of application design (such as navigation). Loading resources from the network and locally. Platform specific differences you need to be aware of. What Flexbox or CSS is. If you haven’t done so already, please follow the instructions on the RN website to get started here - https://facebook.github.io/react-native/docs/getting-started.html. The instructions are very straightforward, you will need node and then install a react-native-cli npm package. Then you are good to go. The current release of the CLI tools makes deployment to Android even easier (as there’s no need to do the adb reverse command anymore. I use Webstorm as my IDE of choice, as I’m a JetBrains user and I can re-use my IntelliJ IDEA and Android Studio settings (including custom kemaps, coding styles, themes, etc). 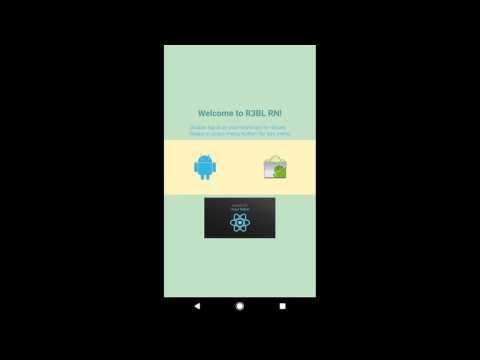 Here’s the github link for this project - https://github.com/r3bl-alliance/react-native-learning. Once you get the project cloned on your development machine, then make sure to run npm install in the root folder where you cloned this repo to. Then open up the project in your favorite IDE. The key thing to remember when doing Flexbox layouts is that everything happens on the main axis or the cross axis. The code in github takes you thru many examples of Flexbox layouts that are relevant to designing apps (things like hero images, headers, text styling, horizontal and vertical layout, and spacing). There’s a main container, which has flex:1, and it has flexDirection:'column'. What this does is that it adds the text fields and button bar and image in a vertical list (from top to bottom). It also has a directive to justifyContent:'center' and alignItems:'center'. justifyContent controls the way in which items are laid out in the main axis (in this case it centers all the items in a vertical, top to bottom direction main axis). And alignItems controls how items are laid out in the cross axis (in this case it centers all the items horizontally across the main axis which is vertical). Take a look at the mainview_style.v_container style below to get an idea of this. There are helpful comments as well, to make sense of what these Flexbox directives mean. Another interesting bit of code is the Flexbox styles that are used to layout the icons (Android and Google Play) in the center of the screen (centered horizontally). If you look at the mainview_style.h_container you will see the code that does this. There’s a reference to a custom font called Rubik-Regular that is loaded (more on this at the end of this document). There are lots of interesting ways in which you can size images in RN. The Image component has lots of useful options to help you size images. The main ones that I’ve found useful are cover and contain. In the Styles.js class, try making changes in the mainview_style object and switch contain to cover and see what happens. You will notice that all the styles that are used in the code in github are all stored in a single file - Styles.js. This was a conscious choice on my part. It is easier to declare these styles inline in the code, but the disadvantage of doing so is that you have styling all over the place and it’s difficult to make sweeping changes in styling in your codebase. Also, if you share this Styles.js file with a designer who’s familiar with CSS, they should be able to make changes to this one file and radically change the UI, since all the layout, graphics, padding, colors, etc are stored in this single file! This is also a great way to engage with designers on your project, since RN holds the promise of changing the traditional approach to the way in which developers and designers interact through wireframes, clickable prototypes, etc. RN projects are enabled to work with Flow static type checking out of the box. I’m a huge proponent of type checking. Typescript can be clunky to use due to the tooling around it. Flow is pretty much invisible for the most part. The tooling isn’t great at this point, but it’s not bad. If you look at the TypeAliases.js code, you will find how I’m lightly using type aliases. In future tutorials, featuring real-world apps, I will lean on this much more heavily. For Webstorm users, here’s more info on Flow and Webstorm. What is in app navigation for? It is to provide you with a mechanism of switching to and between different ‘screens’ in your app. There is a router that basically manages which views are displayed at any given moment, and how transitions between these screens happen. This tutorial is really simple and I chose not to muddy the waters by bringing in Redux (this will happen in a future tutorial on a different project on github). List of pre-defined routes (these describe the different screen destinations in your app). Wiring up calls to Navigator push(...) and pop() which trigger the Navigator to do it’s thing and switch up those screens and end up calling renderScene(). You also have to pass the navigator object as props to the React components contained inside the Navigator component. render() function that uses the Navigator class. renderScene() function that actually performs the task of rendering differnet view hierarchies depending on the current route. The Router.js class is an example that showcases these 4 things. I will go thru greater detail using this as an example below. The Router.js class defines the following pre-defined routes in the routes object. Pre-defined routes are just JSON objects that you create which hold some data about each destination or screen in your app. You can decide what key-value pairs are stored in these objects, as long as you make sure to use these key-value pairs in the renderScene() method later. In this case, I’m using index and name as the main data that I’m storing that represents each route. I have 3 ‘screens’ that I wish for the app to show the user and they are the MainView.js, FlexboxView1.js, and FlexboxView2.js. The Router.js class also passes the Navigator object as props to all the React components that it manages (in this case to MainView.js, FlexboxView1.js, and FlexboxView2.js). Android image - this takes the user to FlexboxView1.js. The way this is achieved is that the onPress handler for the TouchableHighlight pushes a new route into the navigation stack (index:1). Google Play image - this takes the user to FlexboxView2.js. The way this is achieved is that on the onPress handler for the TouchableHighlight pushes a new route into the navigation stack (index:2). Here’s the code for the AndroidBack button listener (which isn’t activated on iOS, which is why we have FlexboxView1 and FlexboxView2 handle their own calls to pop()). This code is in the Router.constructor() method. Note that in both cases, the navigator object is passed as a props to the from Router.js. In this github project, I’ve used classes that are cross platform between iOS and Android, with one exception (the Android BackButton). RN doesn’t require you to doing use a single codebase for both platforms, you can choose to do whatever works for your project. Eg: instead of using Navigator, you can use NavigatorIOS which is a platform specific component and won’t work on Android. Navigation and BackButton aren’t the only two differences that you have to be aware of as you deploy your app onto Android and iOS. I’ve compiled a short list for this github project. In future tutorials, I will take you thru many more examples of this. Finally, keep in mind that fonts that come out of the box in RN on iOS and Android are totally different. Here’s an article that goes into what fonts are available and where. This is why I choose to include my own custom font, so that it would be available on both the iOS and Android apps that are generated. The Android BackButton doesn’t exist on iOS. For the Android app, I use the BackButton listener in the Router.js constructor. Since BackButton functionality isn’t available for the iOS app, I provided a way for the user to navigate back to the homescreen by clicking on the Flexbox View (tap to go back) Text component. RN has some very powerful image loading mechanisms, whether it’s loading an image from the network or from local storage (on the phone). It also supports some very useful and flexible sizing options, such as cover and contain. But the biggest thing to keep in mind for cross platform functionality is that images loaded over the network on iOS must have https in the URI, or they won’t work. This is a key difference between Android and iOS image loading. This is a class on Udemy on React Native (it’s not free). This is another video lecture course online on React Native on shoutem.com.